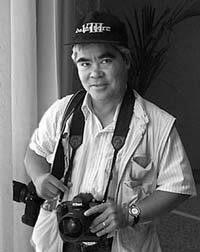 Born on March 29th, 1951, in Long An, Vietnam, Nick Ut is a highly-respected and renowned photographer working for the Associated Press (AP). His real name is Huynh Cong Ut and he is a US citizen residing with his wife and two children in Monterey Park, California. Introduced by his mother to the AP office at only 14 years old, Nick Ut started working for the Associated Press in November 1965, a few weeks after his brother, Huynh Thanh My, who was also working for the AP, was killed while photographing combat scenes during the Vietnam War. Nick Ut was hired by Horst Fass on January 1, 1966, after a six-week trial period during which he mixed photo processing chemicals and kept the darkroom tidy. Although he never took photography classes, by 1967 he managed to become an accomplished photojournalist, his photographs attesting to his skills and courage to shoot the combat action during the communist Tet offensive. Nick Ut was wounded three times while shooting photos depicting the cruel reality of the war in Vietnam. He has continued to work for the AP in South Korea, Hanoi and Tokyo. Published in the New York Times, Ut took the famous photograph of the devastating conflict in Vietnam which captured children screaming and running away from the incredibly painful fire of napalm. He photographed this scene on June 8, 1972 in Trang Bang, which was attacked by the North Vietnamese troops. In addition to earning him the coveted Pulitzer Prize, this photo also won several other awards, including the Word Press Photo of the Year in 1972. Nine-year old Kim Phuc, the child depicted in the center of this photograph while running naked on a road with severe burns on her back caused by the attack, started to receive a lot of attention afterwards. This photo changed not only Kim Phuc’s life, but it made Nick Ut one of the most appreciated and highly-praised photojournalists covering the horror of the Vietnam War. He was recognized not only for his professional abilities, but also for his humanity as well. After taking this photo, Nick Ut took the severely burned little girl to the hospital in Saigon, where she stayed for more than a year and underwent 17 surgical procedures. Kim Phuc has become a Goodwill Ambassador of the United Nations. Nick Ut was the third recipient of the prestigious Pulitzer Prize (awarded in 1973) and in September 2012, 40 years after taking the iconic Pulitzer Prize-winning photograph, he was included in the Leica Hall of Fame for his outstanding achievements in photojournalism. Nick Ut arrived in Los Angeles in 1977 as a Vietnamese refugee. He continued to work as an AP photographer on various assignments. In 1989, he returned to Vietnam to cover the story behind the search for Americans who were still missing in action. In 1993, he opened the new AP office in Hanoi together with his old friend, George Esper. His famous photos, taken on June 8 (again), but this time in 2007, depicted Paris Hilton crying in the back seat of a L.A. County Sheriff’s cruiser as she was transported from her home to court, were published all over the globe.